If I said the phrase “Corporate Cycle Ride” – do you picture endless training, colleagues in full Lycra, a competitive air around the office? Do you feel it will turn into this? 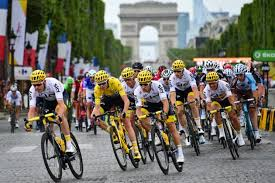 Well it doesn’t have to be like the Tour de France, it can be fun, sociable, still a challenge but an enjoyable one and all the time raising money for a good cause. Let me introduce you to Pedal 4 Cancer. This is a 60 mile cycle ride (not a race!) from London to Cambridge on 8th September 2019. Pedal4Cancer  is a fun-filled event for all. There’s full support along the way, including medical and mechanical back up. You’ll also find  regular break stops throughout the ride, with snacks, water and  toilets. If  you’re new to cycling, fancy a challenge or simply just want to get fit – come and be a part of it. Get your friends, family or colleagues together and take part in a day to remember. Pedal 4 Cancer is also running some great corporate packages – to register a team of 4 it only costs £41 per person, for a team of 8 it’s £39 per person. 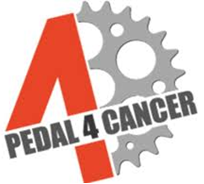 You will be listed on the Pedal 4 Cancer Corporate Page with a link to your fundraising page, promotional images and a welcome across all social media. There will also be space in the corporate area at the finish for cheerers and family members. They will also add your company logo and your charity on promotional material used for advertising the event. 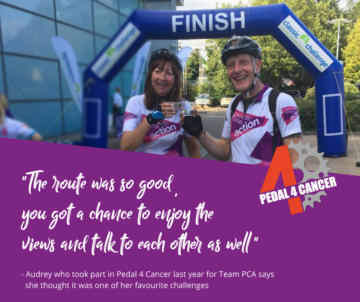 If cycling is not your thing then there are lots of other ways that you and your organisation can support Pancreatic Cancer Action. We have lots of challenge events that take place across the country throughout the year which are great for team morale and collegiality! Previous Article Matt Dalton: 6 marathons in 7 weeks Next Article National Pancreatic Patient and Public Forum!